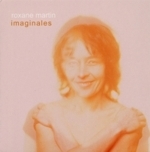 After having explored the music from Bach to St. Saëns, Roxane Martin became fascinated by the spontaneity and depth of the repertoire of popular music. Now she opens you an insight into her imagination which goes back to the sources of internal landscapes shaped during her childhood.In Imaginales she disassembles and assembles in a balancing act of improvisation. In this tightrope walk between past and future she gives an idea of a metamorphosis. She takes the risk and makes us vibrate by a way of tying and retying the symbolic links between the asymmetric set of her 34 strings.